Honk your horns! Chuggington is back in the station with an all-new DVD, Chuggington: Chuggers To The Rescue releasing April 5! A worldwide television hit and an exciting destination for preschoolers, “Chuggington” follows the humorous adventures of ‘traintastic’ pals, Wilson, Brewster and Koko as they ‘ride the rails’ of life on their way to becoming productive chuggers. Featuring a dynamic fleet of relatable and diverse characters, each engaging episode is filled with positive life lessons that encourage and promote early social skills. The colorful and contemporary CGI-animated TV series airs daily on Playhouse Disney, Disney Channel’s learning-focused programming block. In “Chuggers To The Rescue,” everyone’s favorite trainee trio is set to save the day in six horn-tooting episodes that deliver action and laughter, while teaching viewers gentle lessons about emergency preparedness and responsibility. 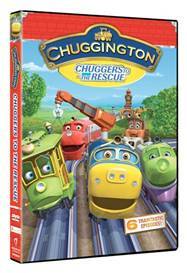 Enter here for your chance to win a copy of the new Chuggington: Chuggers To The Rescue DVD! First entry, tell me for whom you'd love to win this DVD. This is mandatory before other entries will be counted. Be sure to leave a comment for each entry and a valid email address. Open to U.S. and Canada only. Winner will be chosen by random integer selection. The winner will have 48 hours to claim the prize or a new winner will be chosen. Contest will close on April 8, 2011 at 12:00 AM EST. Good Luck!!! My son Jack loves Chuggington so this DVD would be for him!! Great giveaway!